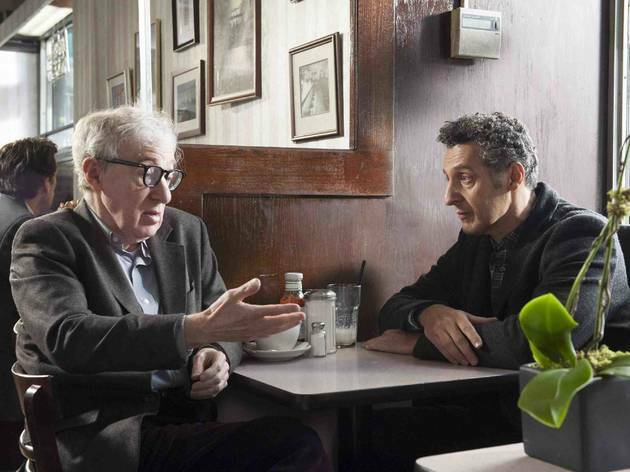 Let’s get the breezy comedy stuff—on the surface of a far more interesting movie—out of the way: Woody Allen plays Murray, an impish bookstore owner facing economic end days. Improbably, he finds himself negotiating sexual encounters for desperate well-to-do women (including dermatologist Sharon Stone and feisty gal pal Sofía Vergara), after realizing that his reticent florist friend, Fioravante (John Turturro), is actually a quiet stud. If you’ve missed the fumbling Allen of Broadway Danny Rose, out of his element and only the “beard,” that guy is back. But Turturro, writing and directing in a register light-years from his nebbishy turn in Barton Fink, has a more sensual NYC indie in mind. One client, the delicate Hasidic widow Avigal (Vanessa Paradis), has never been truly romanced, and she blooms in Fioravante’s gaze, while her Crown Heights neighborhood patroller (Liev Schreiber, terrific in a tricky part) worries on her behalf, partly out of jealousy. This second film is the keeper: the kind of keenly observed cultural clash that still finds room for dancing, a sultry fish-deboning (you just have to see it) and awakening.